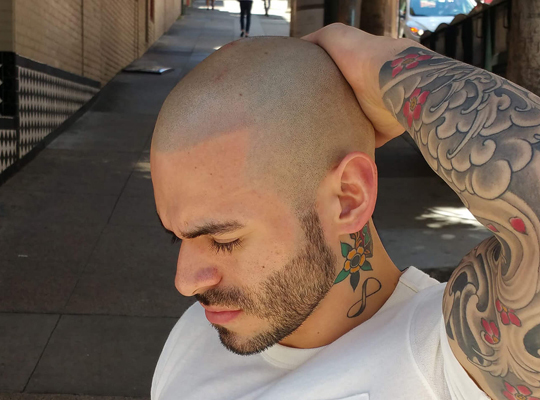 Is scalp micro pigmentation a good fit for you? Ready for a change? Tired of hats? Paranoid using a hair system? Over using Hair Fibers? Restore your receded hairline and give a smart framing to your face. Conceal the visibility of your scar with small, color matched hair follicle deposits. Before commencement of your first Scalp Micro Pigmentation treatment, We highly recommend eating a meal prior to the session. Also clients are encouraged to bring a snack and a beverage. We also provide shaving or hair cutting in house. Please arrive 10 minutes prior to scheduled appointment. We look forward to helping you achieve your desired look and feel for your particular look. Welcome to your Scalp Micro Pigmentation Journey! During the first four days refrain from any activities that can cause profuse sweating, as this can cause excessive fading. Do not wash or cut the treated areas of the scalp for the first four days after each treatment. You may take a shower but try not to get water on the treated area. Also take care that the shower is not hot enough to cause sweating.Refrain from sauna's, swimming pools and any excessive sunlight for 28 days after your last treatment. After 28 days you may start to use sunblock and follow long term aftercare procedures. Long term aftercare rule #1 use spf sunblock preferably Coppertone brand. If you are out in the sun for extended periods of time please reapply throughout the day accordingly. Unprotected exposure to the sun can and will cause unnecessary and early fading issues. Be vigilant and protect your treatment. It is also recommended to use body lotion on your scalp such as Aveeno brand periodically so the skin stays vibrant. After the first 28 days after any treatment you can swim in chlorinated pools without any issues. If you stick to these basic guidelines you will prolong the life of your treatment. Before I chose Scalp Co I went online, read reviews, sat down with many offering scalp micro pigmentation including the big companies. What turned me off on all of them was the fact that I felt like I was being pressed into a hard sale. This was not the case at all with Scalp CO.
After my sessions I returned to work and explained to them what I had done. No one believed it. I wasn't expecting such awe and disbelief. I had several people ask to stair at my head to see if they could notice where my hairline ended. Many just stare and say they can't believe it. I've received a ton of compliments and didn't expect to receive so much positive attention. I can't express enough how impressed I am with Brittney and Scalp Co. They know what they are doing, and more importantly they care about their customers and the work that they perform. Words can not express how amazing John and the team are. My experience coming from Colorado to California to not only train but got to experience a SMP treatment for myself was nothing but extraordinary! I left with not only amazing education but also confidence and being fully prepared to start my own journey. If you want to change your life whether it’s getting a SMP treatment or wanting to learn from the best educators do not hesitate and see Scalp Co. I promise you won’t regret it! They changed my life. After seeing several amazing before and after pictures I decided to do some research. After finding nothing but great reviews, I decided to make an appointment and see it in person. I had such a great first impression. John is a very personable and professional guy and made me feel comfortable immediately. He is very open and honest about the procedure and took the time to answer all of my questions. After seeing how realistic the treatment looked in person, I decided to go for it. I was pretty nervous before my first treatment but John, Britteni and Truitt are so nice and professional that you relax immediately. The office is very clean and looks like a doctors office. You can tell they are meticulous about cleanliness. The entire Scalp Co team is so skilled at designing hairlines and matching the color of your hair. It's amazing how much they care about every treatment. It's obvious that John's number one priority is making sure every client is 100% satisfied. It's no wonder that these guys are so successful. I can't tell you how happy I am with my treatment. Easily one of the best decisions I have ever made. Anyone that I tell is amazed at how realistic it looks. If you are unhappy with your hair loss, do the research and make an appointment. I was balding in the crown area and temples and for head since I was 18. I did my research and came across John. I went in for a consultation and reviewed his previous work as well as contacted his other clients. This reassured me that I'd be in great shape and I left it up to John to do the rest. The environment the procedure is done in is very comforting and time flies by because he is good at holding a conversation and doing his job. Results were excellent as expected; this guy is a pro and I highly recommend Scalp Co! John C.'s work is flawless, natural, and exceptionally realistic. I am very pleased with the results Scalp Co has achieved and remain impressed with John's dedication to his craft. John has a very pleasant demeanor and he goes above and beyond to accommodate his clients' needs. I was initially nervous, but John's professionalism, advice, and quality work put me at ease. I can recommend no other SMP provider than Scalp Co. Thanks John!